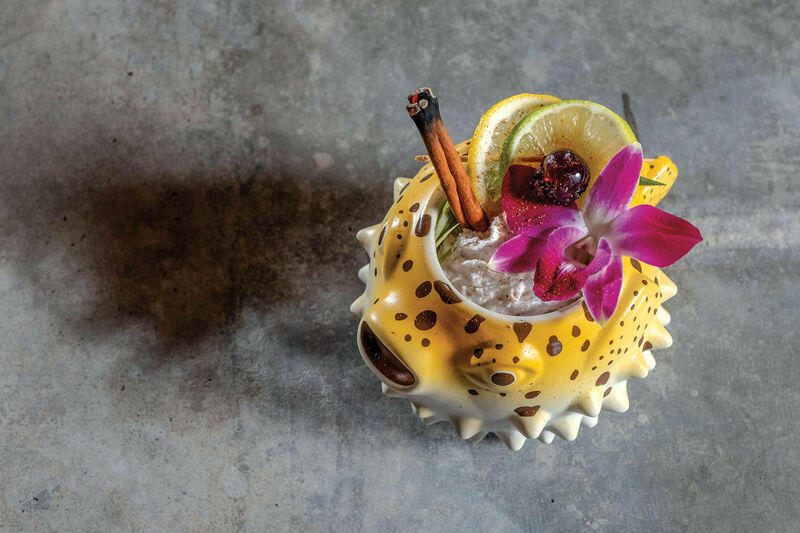 Who doesn't love flowers that bloom all summer? If you're short on space, of course it’s smart to pack your garden with plants that flower over the longest possible season. There are some great long-blooming perennials out there: Texas sage (Salvia x greggii) and Cape fuchsias (Phygelius) flower from May onwards, and Fuchsia and flowering maple (Abutilon) often flower from June to frost. But there’s something especially captivating about a plant that doesn’t flower until until the very moment when everything else is winding down. The season shifts, leaves begin to turn, it feels like the end, and all of a sudden, a brilliant flash of flowers appear. 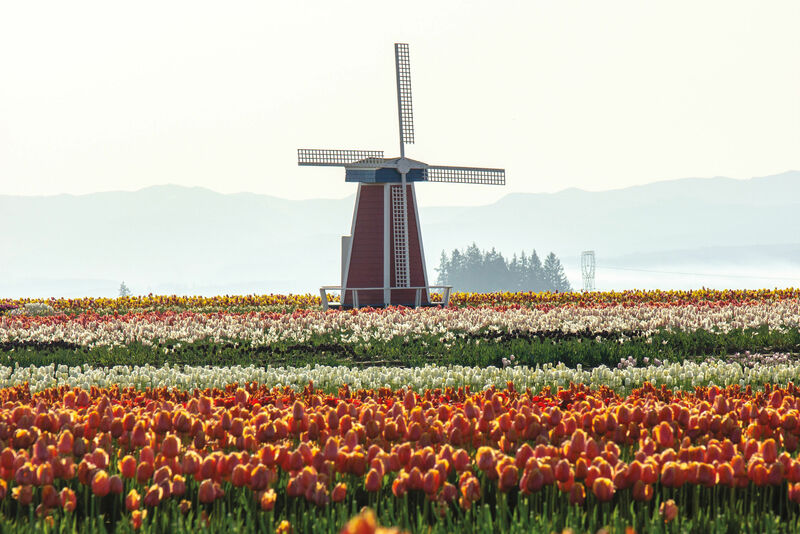 If that sounds like fun stuff, look into these five, very late-blooming plants. You can find them at local nurseries now and, of course, they’ll actually be flowering, so you know exactly what you’re getting. Plant them now, while you can see and enjoy their special attributes. Next October, when the rest of your garden is closing up shop, you’ll be thankful you did. 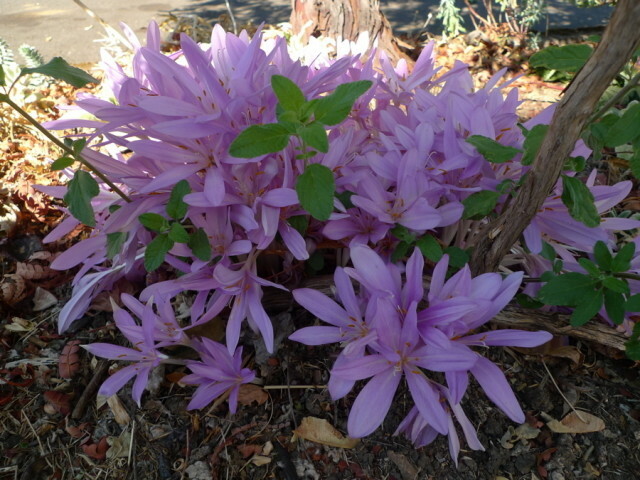 Autumn crocus is perfect for a hot, dry parking strip garden, requiring no summer water or care. A fall-blooming bulb with pinkish-purple or white, goblet-shaped flowers in late September to late October. Flowers usually reach about 5-8” tall. 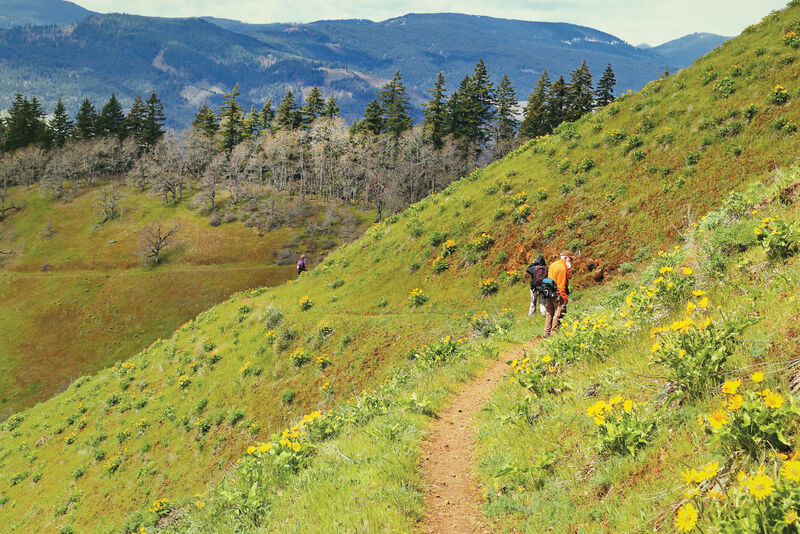 In mid-spring, the leaves rise to about a foot tall – big, coarse and kind of floppy. The foliage disappears for the summer, then the next thing you know, it's late September, and the flowers are popping up like magic on leafless stems. So pretty! It’s the perfect plant for a hot, dry parking strip garden. 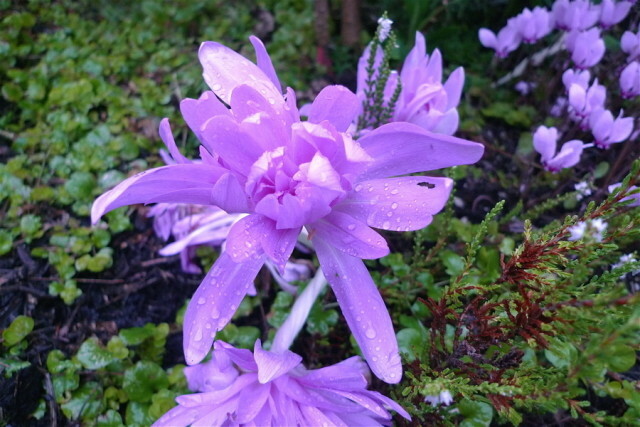 Read more about Colchicum. Note: Colchicum bulbs are usually for sale in August (cheapest when sold in bulb form) but you can usually find them potted up in September and October. 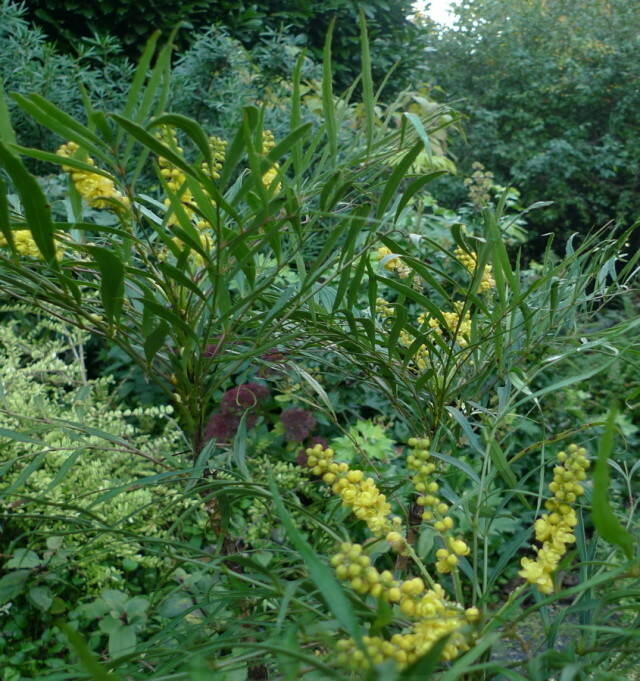 This “Oregon grape” (though Asian in origin, not the Oregon native Mahonia) produces small, sunny yellow sprays of flowers at the tips of stems in October and into November. The narrow, evergreen foliage has a lacy look and is not prickly. 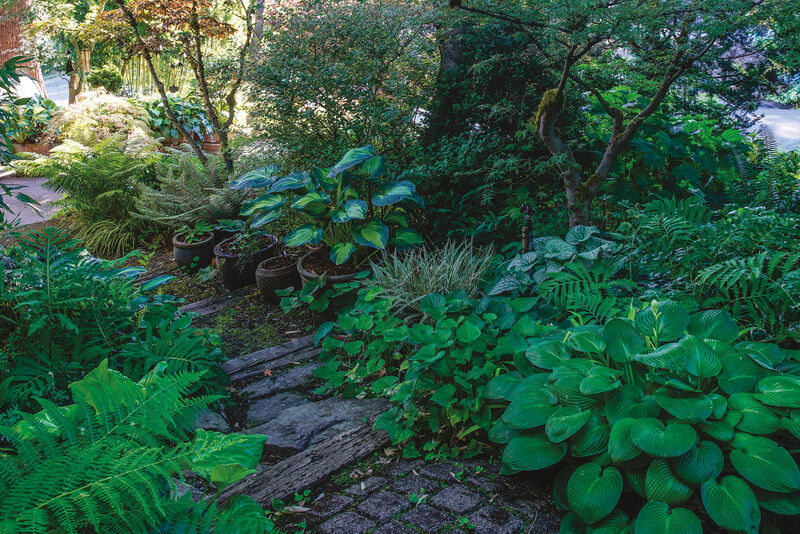 Plants reach about just over 4’ tall and wide, and do best in dappled shade and reasonably moist, well-drained soil. Try local retail nurseries. Most carry it, often under the name “Soft Caress” (a trademarked name). Osmanthus are tough, evergreen shrubs with tiny blossoms scented like orange and apricot that open over a long period, from late September into November. Leaves can be prickly or smooth and gold- or white-variegated, purple-tinted or green. The tiny flowers are usually white or even soft orange. There are dwarf plants reaching just 4’ tall and others that acquire a tree-like stature. Most are pretty tough and drought-tolerant and can take sun or shade. 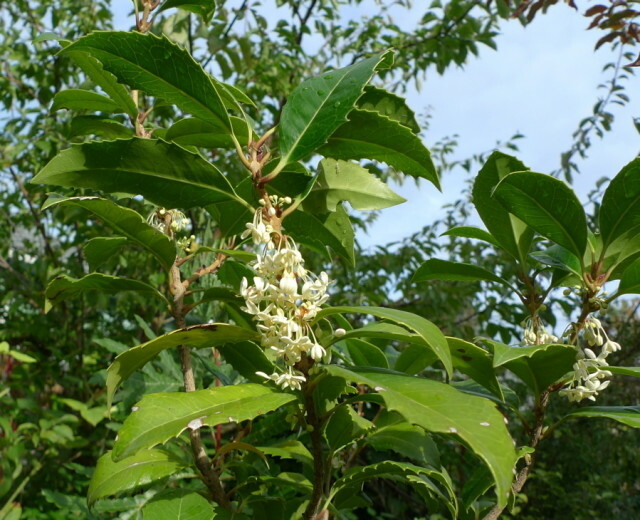 Read more about Osmanthus. Toad lilies look elegant all summer, with neat, usually slightly weeping foliage, but not until fall do you see the delicate, orchid-like flowers. 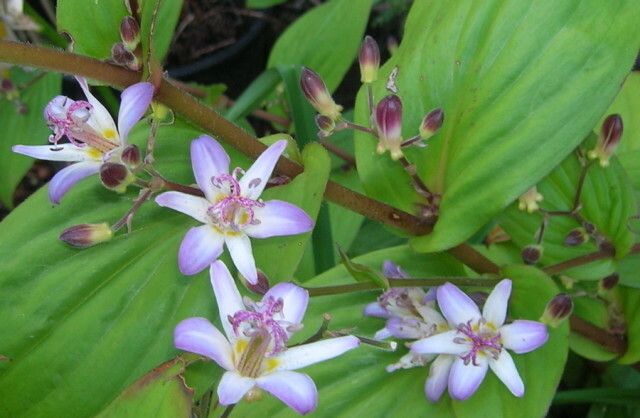 Blossoms appear in the leaf axils along the stem and can be white, purple or any variation of the two. Most toad lilies are 1-2’ tall. A few species are buttery yellow, with a drooping habit. Toad lilies thrive in damp, rich, well-drained soil in partial shade. 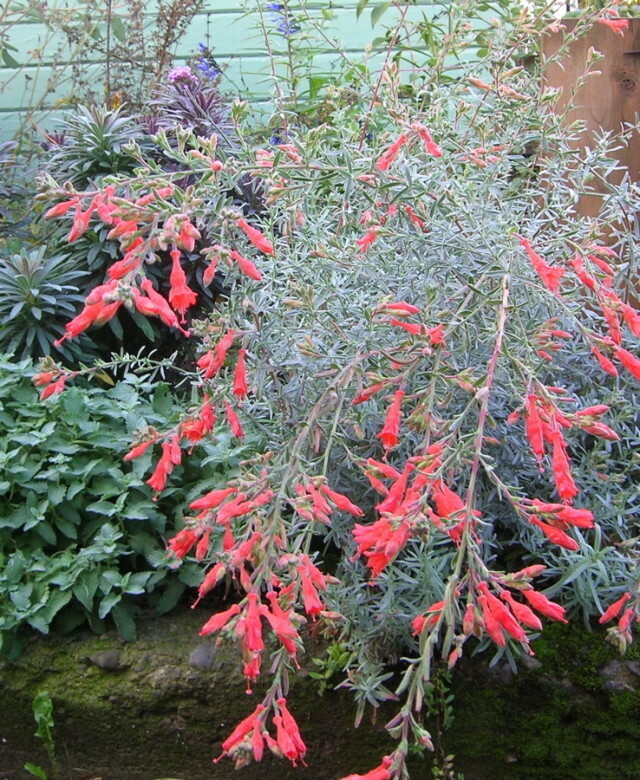 California fuchsia can come into flower in late summer but most don’t really kick into gear until late September to early October – then they flower non-stop til frost. The tubular, sizzling orange flowers attract droves of hummingbirds. (There is a pale pink form, as well.) Some are semi-evergreen, others are deciduous and look like a messy bunch of twigs all winter (birds love to hop through it and root for bugs). These are drought-tolerant, sun-loving plants that are best in poor, lean soil with no supplemental summer water.